As a preschool art teacher, I have to say that I strongly favor process-based art for kids. The research all shows that the true benefit of art for kids comes from the process of making something- mixing colors, experimenting with lines and swirls, and getting hands-on experience with creative expression. 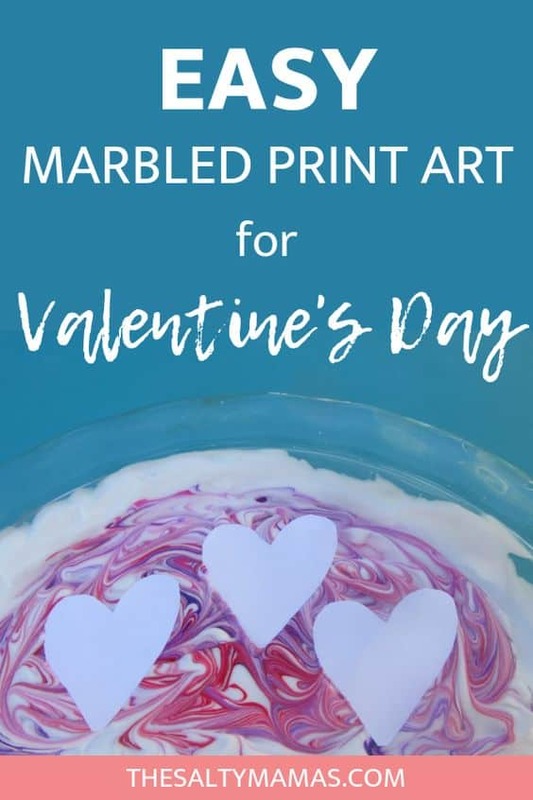 Your average Valentine’s Day art projects for kids, with their prescribed colors and shapes and outcomes, are typically not in line with process-based activities. I’m also a mother. I want some art for my dang refrigerator, gosh darn it. So I’ve created this fun, process based art activity that will end with a product that you can display. 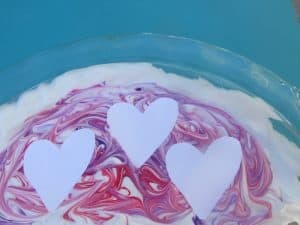 By limiting the colors you present the kids with (pink, purple, and red for example), you can ensure that this process based Valentine’s Day art project stays on theme- and the kids will be none the wiser. First choose a shallow pan. A pie pan will work perfectly. 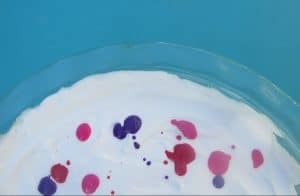 Fill the pan with shaving cream. (The kids looooove to do this part themselves.) Smooth it out a little. 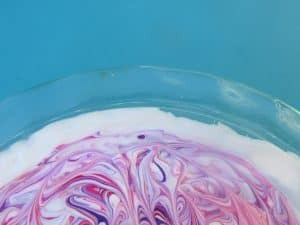 Once you’ve got your shaving cream added to the pan, it’s time to turn it into shaving cream paint! 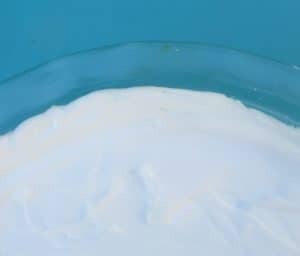 You can use either food coloring or washable paints for this part. Food coloring mixes in a little easier, but I liked the different shades I could get by using paints. So for this project, I used Crayola Washable Paints. Kids LOVE to get hands on with this part. Using a skewer, chopstick, or paint brush, swirl the colors together. 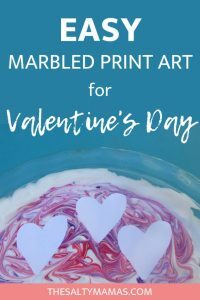 You’ll want to stop before the colors become mixed up, as the variation in shades is what makes this process based Valentine’s Day art SO dang pretty. Cut a heart shape out of cardstock or watercolor paper. I like to cut a few larger hearts and a few smaller ones. If your kids are older, have them do this part on their own. 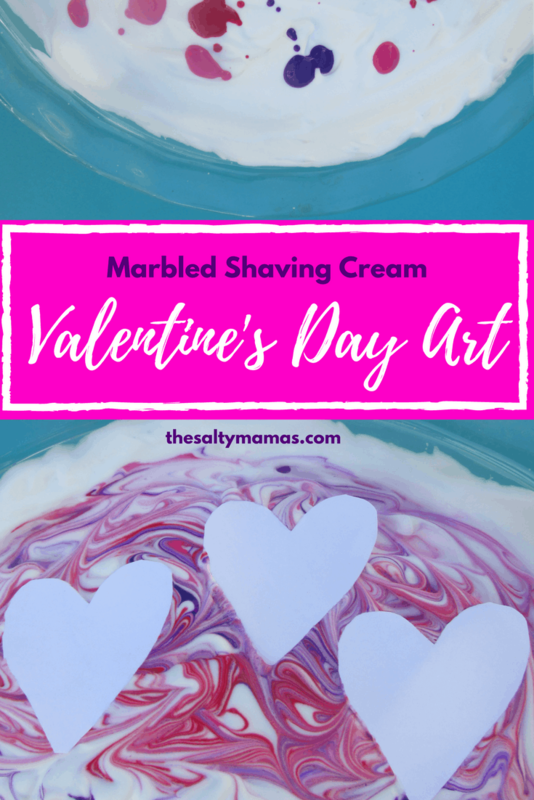 Lay the paper on top of the marble shaving cream. Let it set for a half minute or so. Lift up gently. 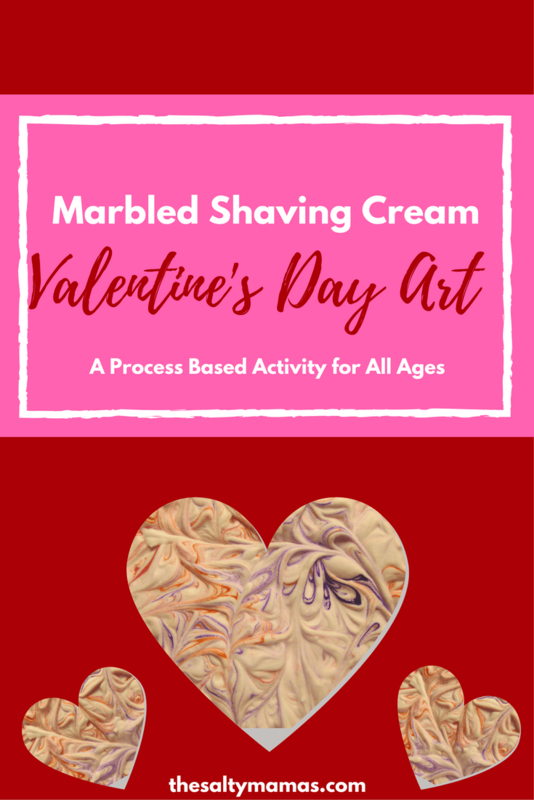 Using a flat object- like a ruler, or the chopstick you used earlier- scrape the shaving cream off of the paper in a long, smooth line (or as close to it as you can manage). Allow them to dry, and you’re done! 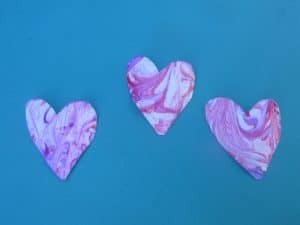 Experiment with different sizes of hearts, colors, and types of paper to allow your kids to use their creativity to the maximum. You could also provide paintbrushes to give them the option to paint directly on their paper if they choose to. The variations are endless, and the end results? A Valentine’s Day art project that is truly priceless. I think I had more fun than the kids did- and that’s saying something! Those are adorable!! What a cute idea! Thanks! It’s a simple idea, but oh-so-fun! Well this is kind of crazy because I dropped K off at pre-school this morning and they said they’d be painting and using shaving cream. I was wondering how the heck that went together. Maybe they read your blog, lol. You’re so darn cute! I let my kids paint with Jello on the floor the other day. And by let them paint with Jello, I mean left the room while they were eating Jello. This looks like so much fun! I’ll have to suggest doing it in my son’s classroom. It really is such fun. I bet your son would love it! Thanks for stopping by!